The Pentagon helps Hollywood to make money and, in turn, Hollywood churns out effective propaganda for the brutal American war machine. The US has the largest military budget in the world, spending over $611 billion – far larger than any other nation on Earth. The US military also has at their disposal the most successful propaganda apparatus the world has ever known ... Hollywood. 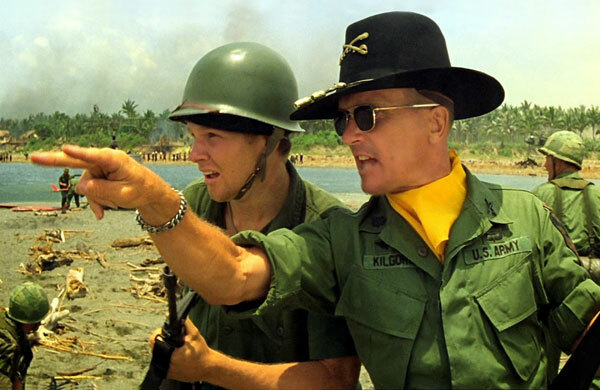 Francis Ford Coppola’s Apocalypse Now – Robert Duvall and Sam Bottoms. Since their collaboration on the first Best Picture winner Wings in 1927, the US military has used Hollywood to manufacture and shape its public image in over 1,800 films and TV shows. Hollywood has, in turn, used military hardware in their films and TV shows to make gobs and gobs of money. A plethora of movies like Lone Survivor, Captain Philips, and even blockbuster franchises like Transformers and Marvel, DC and X-Men superhero movies have agreed to cede creative control in exchange for use of US military hardware over the years. In order to obtain cooperation from the Department of Defence (DoD), producers must sign contracts that guarantee a military approved version of the script makes it to the big screen. In return for signing away creative control, Hollywood producers save tens of millions of dollars from their budgets on military equipment, service members to operate the equipment, and expensive location fees. In other words, the Department of Defence is using taxpayer money to pick favourites. The DoD has no interest in nuance, truth or – God forbid – artistic expression; only in insidious jingoism that manipulates public opinion to their favour. This is chilling when you consider that the DoD is able to use its financial leverage to quash dissenting films it deems insufficiently pro-military or pro-American in any way. The danger of the DoD-Hollywood alliance is that Hollywood is incredibly skilled at making entertaining, pro-war propaganda. The DoD isn’t getting involved in films like Iron Man, X-Men, Transformers or Jurassic Park III for fun. They are doing so because it’s an effective way to psychologically program Americans, particularly young Americans, not just to adore the military, but to worship militarism. This ingrained love of militarism has devastating real-world effects. As Suid points out, generations of Americans had been raised watching John Wayne valiantly storm the beaches of Normandy in films like The Longest Day, and thus were primed to be easily manipulated into supporting any US military adventure because they were conditioned to believe that the US is always the benevolent hero and inoculated against doubt. This indoctrinated adoration of a belligerent militarism, conjured by Hollywood blockbusters, also resulted in Americans being wilfully misled into supporting a farce like the 2003 Iraq War. The psychological conditioning for Iraq War support was built upon hugely successful films like Saving Private Ryan (1998), directed by Steven Spielberg, and Black Hawk Down (2001), produced by Jerry Bruckheimer, that emphasised altruistic American militarism. Spielberg and Bruckheimer are two Hollywood heavyweights considered by the DoD to be their most reliable collaborators. Another example of the success of the DoD propaganda program was the pulse-pounding agitprop of the Tom Cruise blockbuster Top Gun (1986). The movie, produced by Bruckheimer, was a turning point in the DoD-Hollywood relationship, as it came amid a string of artistically successful, DoD-opposed, “anti-war” films, like Apocalypse Now, Platoon and Full Metal Jacket, which gave voice to America’s post-Vietnam crisis of confidence. Top Gun was the visual representation of Reagan’s flag-waving optimism, and was the Cold War cinematic antidote to the Vietnam Syndrome. Top Gun, which could not have been made without massive assistance from the DoD, was a slick, two-hour recruiting commercial that coincided with a major leap in public approval ratings for the military. With a nadir of 50 percent in 1980, by the time the Gulf War started in 1991, public support for the military had spiked to 85 percent. Since Top Gun, the DoD propaganda machine has resulted in a current public approval for the military of 72 percent, with Congress at 12 percent, the media at 24 percent, and even Churches at only 40 percent. The military is far and away the most popular institution in American life. Other institutions would no doubt have better approval ratings if they too could manage and control their image in the public sphere. It isn’t just the DoD that uses the formidable Hollywood propaganda apparatus to its own end ... the CIA does as well, working with films to enhance its reputation and distort history. For example, as the War on Terror raged, the CIA deftly used Charlie Wilson’s War (2007) as a disinformation vehicle to revise their sordid history with the Mujahideen in Afghanistan and to portray themselves as heroic and not nefarious. The CIA also surreptitiously aided the film Zero Dark Thirty (2012), and used it as a propaganda tool to alter history and convince Americans that torture works. The case for torture presented in Zero Dark Thirty was originally made from 2001 to 2010 on the hit TV show 24, which had support from the CIA as well. That pro-CIA and pro-torture narrative continued in 2011 with the Emmy-winning show Homeland, created by the same producers as 24, Howard Gordon and Alex Gansa. A huge CIA-Hollywood success story was Best Picture winner Argo (2012), which ironically is the story of the CIA teaming up with Hollywood. The CIA collaborated with the makers of Argo in order to pervert the historical record and elevate their image. The fact that this propaganda devil’s bargain between the DoD/CIA and Hollywood takes place in the self-declared Greatest Democracy on Earth™ is an irony seemingly lost on those in power who benefit from it, and also among those targeted to be indoctrinated by it, entertainment consumers, who are for the most part entirely oblivious to it. If America is the Greatest Democracy in the World, why are its military and intelligence agencies so intent on covertly misleading its citizens, stifling artistic dissent, and obfuscating the truth? The answer is obvious ... because in order to convince Americans that their country is The Greatest Democracy on Earth, they must be misled, artistic dissent must be stifled and the truth must be obfuscated. In the wake of the American defeat in the Vietnam war, cinema flourished by introspectively investigating the deeper uncomfortable truths of that fiasco in Oscar-nominated films like Apocalypse Now, Coming Home, The Deer Hunter, Platoon, Full Metal Jacket and Born on the Fourth of July, all made without assistance from the DoD. The stultifying bureaucracy of America’s jingoistic military agitprop machine is now becoming more successful at suffocating artistic endeavours in their crib. With filmmaking becoming ever more corporatised, it is an uphill battle for directors to maintain their artistic integrity in the face of cost-cutting budgetary concerns from studios. In contrast to post-Vietnam cinema, after the unmitigated disaster of the US invasion of Iraq and the continuing quagmire in Afghanistan, there has been no cinematic renaissance, only a steady diet of mendaciously patriotic, DoD-approved, pro-war drivel like American Sniper and Lone Survivor. Best Picture winner The Hurt Locker (2008), shot with no assistance from the DoD, was the lone exception that successfully dared to portray some of the ugly truths of America’s Mesopotamian misadventure. Eisenhower’s prescient warning should have extended to the military industrial entertainment complex of the DoD/CIA-Hollywood alliance, which has succeeded in turning Americans into a group of uniformly incurious and militaristic zealots. America is now stuck in a perpetual pro-war propaganda cycle, where the DoD/CIA and Hollywood conspire to indoctrinate Americans to be warmongers and, in turn, Americans now demand more militarism from their entertainment and government. Wash. Rinse. Repeat. The DoD/CIA-Hollywood propaganda alliance guarantees Americans will blindly support more future failed wars and will be willing accomplices in the deaths of millions more people across the globe.